Come experience an unforgettable New Year’s Eve in Paris. After a tour of the city in the most symbolic quartiers of the City of Light, you will enjoy a dinner on the Seine, followed by an evening of dancing, for an exceptional New Year’s Eve experience. You will go to our agency, located in the heart of Paris, where you will board a panoramic motor coach. You will tour the illuminated streets of the capital. You will see the magic of Christmas unfurl before your eyes along the quartiers and the grand monuments of Paris, decorated with their beautiful Christmas decorations. The liveliness of the streets mixes with the frenzy of New Year’s Eve. Among the great sights of Paris, you will see the Arc de Triomphe, which dominates the beautiful Champs Elysées, the Invalides, the quartier of Saint-Germain des Prés, the Opéra Garnier, the Eiffel Tower, and of course, Notre-Dame de Paris. After a 1 1/2 hour tour of the city, you will be brought to the Quai de Bercy embarkation point to board La Marina at 8:45 p.m. You will depart on a 3 hour cruise, during which you will enjoy a delicious dinner on the Seine, for a truly original New Year’s Eve. A gastronomic and refined meal will be served after a perfect champagne aperitif. In this warm and welcoming setting, you will enjoy a special new menu, while you admire the view over Paris. As you float over the water, you will see the grand sites and monuments along the banks, as well as the superb bridges of Paris that cross the Seine. They are decorated with magnificent lights for the Christmas season. You will also see the Louvre, the Cathedral of Notre-Dame, the Conciergerie, the Invalides, and three of the most beautiful bridges of Paris, the Pont Neuf, the Pont des Arts and the Pont Alexandre III. You will then share in a dazzling and magical spectacle when you arrive at the foot of the sparkling Eiffel Tower. You will then return to the Quai de Bercy, where an evening of dancing awaits you. New Year’s Eve continues in the beautiful musical ambiance, led by a DJ all night long. 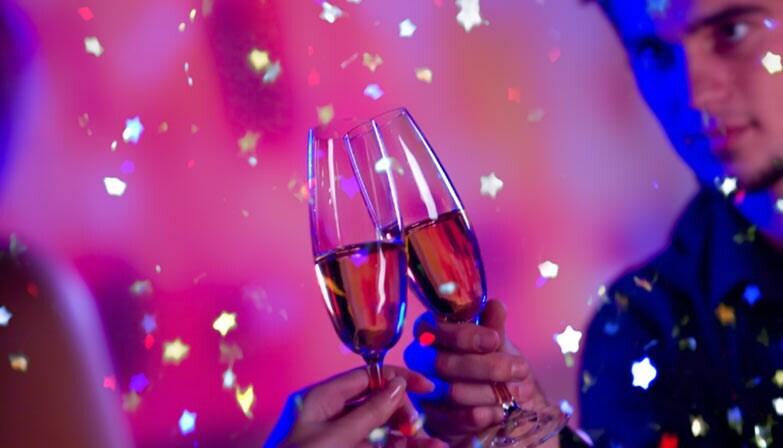 This mixture of gastronomy and celebration is perfect to cap off a successful and unforgettable New Year’s Eve. Dancing atmosphere with a DJ to celebrate the New Year! End at the Quai de Bercy. No return to hotels. Illuminated City tour of Paris with individual earphones. Special New Year's Eve Dinner-Cruise at "La Marina de Paris" + DJ. Don’t miss New Year’s Eve in Paris! The dinner will be followed by dancing to DJ music to end the year in style! You should choose to spend one New Year's Eve of your life on this tour. It started with a bus tour of the city for about 90 minutes with Paris lit up for New Years. There is an audio tour through ear buds in any of 12 languages. You then transfer to the boat, starting with champagne and appetizers. Warm and fully glass encased with every table hear a window, you begin your cruise. Usually on dinner cruises one expects a truly mediocre meal. Not so on this cruise. You pass the sights of Paris and end up just next to t he Eiffel Tower as the DJ counts down to midnight with paper hats, streamers, etc. Dancing then begins until you reach the departure quasi around one-thirty. Being right at the Eiffel Tower at midnight, warm and with no crowd was just wonderful and the wait staff could not have been more accommodating.